Vesper is an exciting British label launched in 2012, focusing on figure-sculpting, flattering dresses and separates that transition easily from desk to dinner. 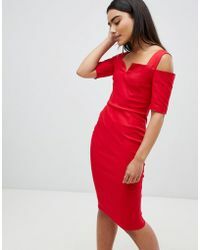 It emphasizes comfortable, super-stretch fabrics, bodycon silhouettes and fashion-forward details that are sure to turn heads, resulting in a must-have selection of Vesper dresses you'll want to wear every day. Today, the Vesper dresses collection features everything from super-sleek sheath dresses to fit-and-flare minis and jaw-dropping maxis with figure-hugging shapes and plunge necklines. From the office to evening drinks, transform your look with these high-octane designs.